Background and objectives Incomplete distal renal tubular acidosis is a well known cause of calcareous nephrolithiasis but the prevalence is unknown, mostly due to lack of accepted diagnostic tests and criteria. The ammonium chloride test is considered as gold standard for the diagnosis of incomplete distal renal tubular acidosis, but the furosemide/fludrocortisone test was recently proposed as an alternative. Because of the lack of rigorous comparative studies, the validity of the furosemide/fludrocortisone test in stone formers remains unknown. In addition, the performance of conventional, nonprovocative parameters in predicting incomplete distal renal tubular acidosis has not been studied. Design, setting, participants, & measurements We conducted a prospective study in an unselected cohort of 170 stone formers that underwent sequential ammonium chloride and furosemide/fludrocortisone testing. Results Using the ammonium chloride test as gold standard, the prevalence of incomplete distal renal tubular acidosis was 8%. Sensitivity and specificity of the furosemide/fludrocortisone test were 77% and 85%, respectively, yielding a positive predictive value of 30% and a negative predictive value of 98%. 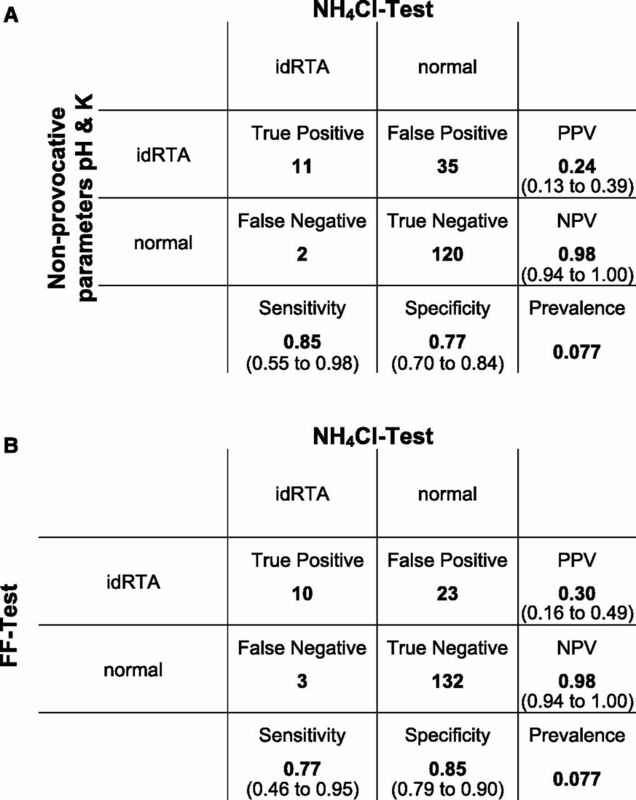 Testing of several nonprovocative clinical parameters in the prediction of incomplete distal renal tubular acidosis revealed fasting morning urinary pH and plasma potassium as the most discriminative parameters. The combination of a fasting morning urinary threshold pH <5.3 with a plasma potassium threshold >3.8 mEq/L yielded a negative predictive value of 98% with a sensitivity of 85% and a specificity of 77% for the diagnosis of incomplete distal renal tubular acidosis. Conclusions The furosemide/fludrocortisone test can be used for incomplete distal renal tubular acidosis screening in stone formers, but an abnormal furosemide/fludrocortisone test result needs confirmation by ammonium chloride testing. Our data furthermore indicate that incomplete distal renal tubular acidosis can reliably be excluded in stone formers by use of nonprovocative clinical parameters. Incomplete distal renal tubular acidosis (dRTA) is a condition characterized by defective urinary acidification capacity in the absence of systemic metabolic acidosis. The entity was first described by Wrong and Davies in 1959 who reported three patients that were unable to maximally acidify their urine upon administration of an oral acid load (100 mg [1.86 mmol] ammonium chloride/kg body wt) (1). On the basis of this study the one-day single dose (“short”) ammonium chloride loading test became the “gold standard” for diagnosis (1). Typically, a pH<5.3 has been accepted as the threshold to rule out dRTA but there has never been a clear consensus on this threshold pH and various other definitions have been employed in the past (2–8). Using nonuniform definitions and provocative test procedures, a wide range of prevalence of incomplete dRTA from 2% to 21% have been reported in recurrent stone formers (3,9,10). Provocative urinary acidification testing is not routinely conducted at most stone clinics, but most clinics have routine clinical data on their patients with nephrolithiasis. How well conventional nonprovocative clinical parameters perform in the prediction of incomplete dRTA is not known and previous recommendations have been based primarily on expert opinions rather than data (10,11). Even when the short ammonium chloride loading test can be performed in some centers, gastrointestinal side effects occur frequently after ammonium chloride ingestion. In 2007, Walsh et al. described an alternative provocation of distal acidification, the furosemide/fludrocortisone test, which is better tolerated than the ammonium chloride loading test (12). In a study that included ten patients with nephrolithiasis or nephrocalcinosis (all without dRTA), Viljoen et al. observed a high false positive rate of incomplete dRTA diagnosis with the furosemide/fludrocortisone test compared with the gold standard ammonium chloride test, but fludrocortisone was given 10 hours before test start and not simultaneously, as described by Walsh et al. (12,13). Thus, because of the current lack of adequately powered well controlled comparative studies, the validity of the furosemide/fludrocortisone test in uncovering incomplete dRTA in stone formers remains unknown. To address the issues outlined above, we compared clinical nonprovocative parameters and the furosemide/fludrocortisone test results to the standard short ammonium chloride test in an unselected group of stone formers referred to our clinic for metabolic stone work-up. This was a prospective comparative study. Study participants were recruited from stone formers referred to the Division of Nephrology and Hypertension at the Bern University Hospital between September of 2012 and June of 2016. Inclusion criteria were: (1) ≥1 kidney stone episodes, (2) age≥18, and (3) written informed consent. Exclusion criteria were: (1) active urinary tract infection, (2) intake of medications known to interfere with urinary acidification, and (3) pregnancy or lactation. Failure to acidify urinary pH <5.3 in the ammonium chloride test was considered diagnostic for incomplete dRTA diagnosis. Complete dRTA was defined as presence of a pathologic urinary acidification test with a concomitant metabolic acidosis in the morning fasting blood gas analysis (blood pH <7.35 and blood bicarbonate <21 mEq/L). Patients with an abnormal urinary acidification test without metabolic acidosis were considered to have incomplete dRTA. No sample size calculation was performed before start of the study because: (1) the prevalence of idRTA in our referred patients was not known, and (2) absence of data with respect to the performance of the furosemide/fludrocortisone test in the diagnosis of idRTA in an unselected cohort of stone formers. The study was approved by the Ethical Committee of the Kanton Bern (approval # 90/12), registered at ClinicalTrials.gov (NCT01690039), and conducted in accordance with the Declaration of Helsinki. Metabolic work-up for stone disease included two 24-hour urines on a random outpatient diet. Urine and blood analyses were performed at the Central Laboratory of the University Hospital of Bern, Switzerland using standard laboratory methods. Urine pH in 24-hour urines was measured by an S20 SevenEasy pH meter (Mettler Toledo, Greifensee, Switzerland). eGFR was calculated according to the CKD-EPI (Chronic Kidney Disease Epidemiology Collaboration) equation (14). Diabetes was defined as reported, treated, fasting glycemia ≥126 mg/dl, or random glycemia ≥200 mg/dl. Hypertension was defined as reported, treated, a mean systolic BP ≥140 mmHg, or a mean diastolic BP ≥90 mmHg. All participants underwent sequential ammonium chloride and furosemide/fludrocortisone testing, at least 1 week and at most 1 month apart, regardless of 24-hour or fasting urinary pH or type of stone, thereby constituting a completely unselected population of calcareous stone formers. The short one-day ammonium chloride loading test and the furosemide/fludrocortisone test were performed as previously described (1,12). Study participants fasted after midnight and throughout the tests. For the ammonium chloride test, ammonium chloride gelatin capsules (100 mg/kg body weight) were given at 0800 hours with water in the presence of the nursing staff over a period of 30 minutes. During the test, fluid intake was ad libitum. Venous blood samples were obtained for chemistry, pH, and blood gases at 0800, 1000, and 1200 hours. Urine was collected hourly from 0800 to 1400 hours. For the furosemide/fludrocortisone test, furosemide (40 mg) and fludrocortisone (1 mg) were given at 0800 hours with water in the presence of the nursing staff. During the test, fluid intake was ad libitum. Venous blood samples were obtained for chemistry, pH, and blood gases at 0800, 1100, and 1300 hours. Urine was collected hourly from 0800 to 1300 hours. Venous blood gas and electrolyte analysis was performed immediately after collection on a ABL800FLEX blood gas analyzer (Radiometer, Thalwil, Switzerland). Urine pH was measured by an S20 SevenEasy pH meter and urinary pCO2 by an ABL700 blood gas analyzer (Radiometer, Thalwil, Switzerland) immediately after collection. Statistical analyses were conducted using the R software, version 3.2.2 (15). All statistical tests were two-sided and a P<0.05 was considered as statistically significant. Agreement between the two urinary acidification tests was analyzed by the Bland–Altman method using the R package “BlandAltmanLeh” (16). Receiver operating characteristic (ROC) analysis was done using the R package “pROC” (17). 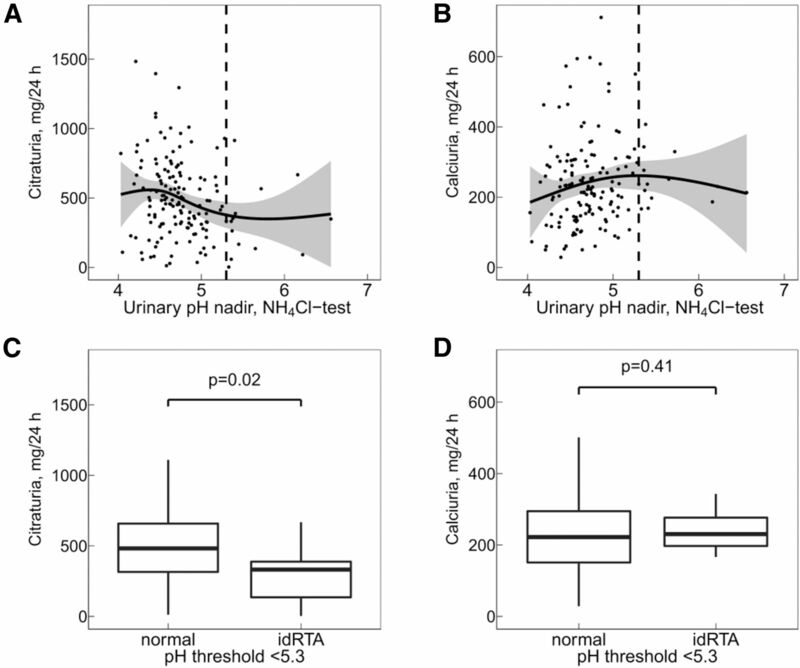 The sensitivity-specificity versus nadir urinary pH plot (see below) was done by using the R package “OptimalCutpoints” (18). 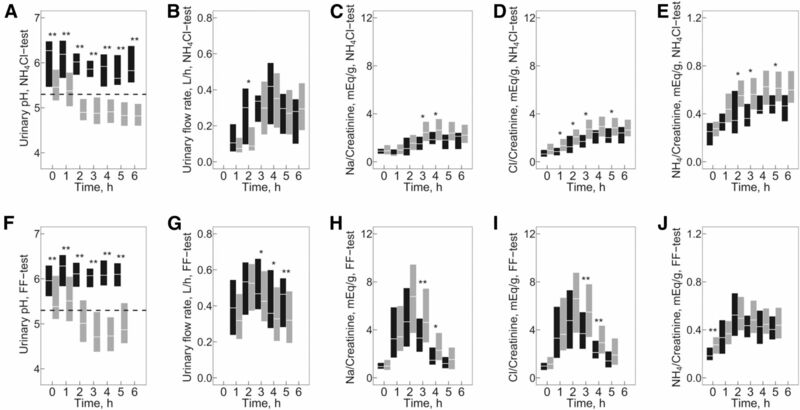 The associations of the nadir urinary pH with 24-hour citraturia and calciuria were visually assessed by cubic spline functions of the nadir urinary pH and by boxplots stratifying the nadir urinary pH at different thresholds. Two of the 170 individuals recruited had complete dRTA and were excluded from the final analysis. Baseline characteristics of the remaining 168 participants are depicted in Table 1. Median age of the study population was 45 years; 73% of participants were men. The majority of individuals (76%) had at least two symptomatic stone events; stone analysis was available in 83% of individuals. Baseline blood and urinary biochemistries are depicted in Supplemental Table 1. Baseline characteristics of study population. Thirteen participants (8%) in the ammonium chloride test and 33 participants (20%) in the furosemide/fludrocortisone test had a nadir urinary pH ≥5.3. Baseline characteristics of stone formers, listed separately by test and nadir urinary pH, are depicted in Table 2. Stone formers with nadir urinary pH ≥5.3 in the ammonium chloride test had a lower body mass index (P=0.02). Kidney stones of participants with nadir urinary pH ≥5.3 in both tests were less likely to contain calcium oxalate but more likely to contain calcium phosphate. None of the stones of participants with nadir urinary pH ≥5.3 contained uric acid. Stone formers with nadir urinary pH ≥5.3 in the ammonium chloride test displayed a significantly lower plasma potassium and 24-hour citrate excretion, whereas 24-hour urea excretion (a measure of daily protein intake), net gastrointestinal alkali absorption (an arithmetic estimate of daily alkali intake), and kidney function were similar in subjects with nadir urinary pH <5.3 or ≥5.3 (Table 3) (17). Baseline characteristics according to nadir urinary pH in furosemide/fludrocortisone and ammonium chloride tests. Blood and urinary parameters according to nadir urinary pH in furosemide/fludrocortisone and ammonium chloride tests. How Well Do Nonprovocative Parameters Perform in Predicting Incomplete dRTA? To this end, we tested the performance of the nonprovocative parameters second morning fasting urinary pH, plasma potassium, plasma bicarbonate, 24-hour citraturia, and stone calcium phosphate content in the prediction of incomplete dRTA, defined by nadir urinary pH ≥5.3 in the ammonium chloride test. Second morning fasting urinary pH instead of 24-hour urinary pH was chosen because correlation of the nadir urinary pH in the ammonium chloride test was better with the fasting morning urinary pH than the 24-hour urinary pH (Supplemental Figure 1). ROC analysis revealed that a second morning fasting urinary pH and plasma potassium had the highest individual area under the curve (AUC) for the prediction of incomplete dRTA, and a combination of the two parameters—second fasting morning urinary pH and plasma potassium—further increased the AUC (Supplemental Figure 2). Combination of a fasting morning urinary threshold pH of <5.3 and a plasma potassium threshold of >3.8 mmol/L yielded a negative predictive value of 98% and a positive predictive value of 24% for the diagnosis of incomplete dRTA (Figure 1A). Use of a higher urinary pH threshold caused a significant decrease of specificity; use of a higher plasma potassium threshold resulted in significantly lower negative predictive values (not shown). Performance of nonprovocative clinical parameters (A) and of furosemide/fludrocortisone testing (B) in the prediction of incomplete distal renal tubular acidosis in stone formers. A second morning fasting urinary pH <5.3 and a plasma potassium >3.8 mEq/L were used as nonprovocative thresholds. In parentheses, 95% confidence intervals are indicated for sensitivity, specificity, positive predictive value (PPV), and negative predictive value (NPV). FF, furosemide/fludrocortisone test; idRTA, incomplete distal renal tubular acidosis. Utilizing the ammonium chloride test as gold standard, sensitivity and specificity of the furosemide/fludrocortisone test were 77% and 85%, respectively, yielding a positive predictive value of 30% and a negative predictive value of 98% for the diagnosis of dRTA, respectively (Figure 1B). 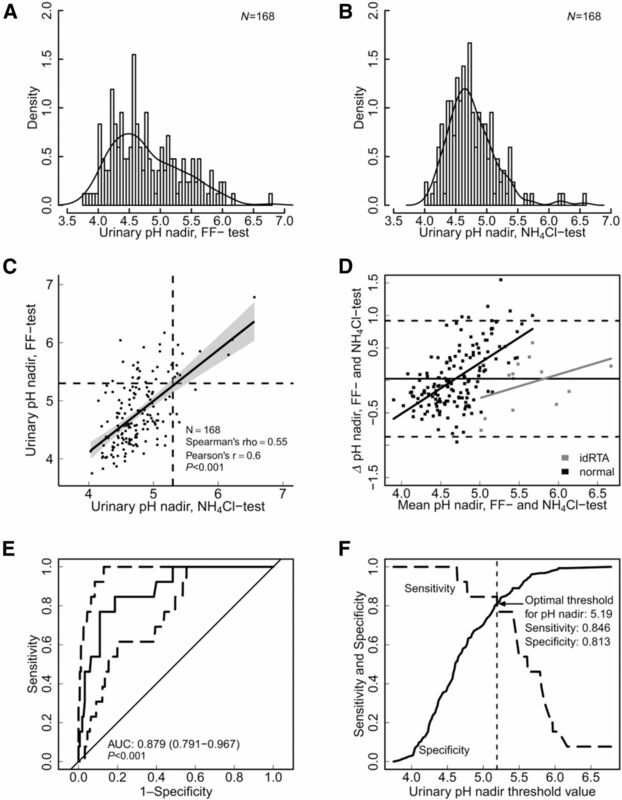 Distributions of nadir urinary pH values for both tests are depicted as histograms with kernel density plots in Figure 2, A and B. In both tests, there was no evidence for a bimodal distribution of the urinary pH nadir values. Statistical test comparison revealed a highly significant although only moderately positive linear relationship between the nadir urinary pH values of the two tests (Figure 2C). The absolute mean-difference plot (Bland–Altman plot) for the two tests is depicted in Figure 2D. The mean bias was +0.025 pH units, and the lower and upper limits of agreement were −0.87 and 0.92, respectively, and contained 160 of the 168 data points (95%), as expected in case of a normal distribution (20,21). There was a tendency to more positive differences at higher pH nadir values, i.e., an increase in bias with magnitude as shown by the positive slopes of linear regression lines in Figure 2D. The AUC of the ROC analysis was 0.88 (95% confidence interval, 0.79 to 0.97) (Figure 2E). The sensitivity-specificity versus nadir urinary pH plot analysis yielded an optimal threshold nadir urinary pH of 5.19 for the furosemide/fludrocortisone test at a sensitivity and specificity threshold of 85% and 81%, respectively, which is close to the currently employed threshold urinary pH <5.3 (Figure 2F). Comparison of ammonium chloride and furosemide/fludrocortisone test results. (A) Histogram of urinary pH nadir in furosemide/fludrocortisone test with Kernel density plot. (B) Histogram of urinary pH nadir in ammonium chloride test with Kernel density plot. (C) Association of ammonium chloride test and furosemide/fludrocortisone test nadir urinary pH values. The regression line (solid black line) with 95% confidence interval (95% CI) (gray area) was created by a linear model. Dashed lines indicate the pH threshold of 5.3 on both axes. (D) Bland–Altmann plot with regression lines for participants without (black line) or with incomplete dRTA (gray line). Horizontal dashed lines indicate upper and lower limits of agreement calculated as the 95% CI around the mean bias (horizontal solid line). (E) Receiver operating characteristic curve for the furosemide/fludrocortisone test. Dashed lines around the ROC curve indicate the 95% CI of the sensitivity at the given specificity points. The area under the curve (AUC) and its 95% CI are indicated. (F) Sensitivity-specificity versus nadir urinary pH plot indicate the nadir urinary pH threshold in the furosemide/fludrocortisone test where sensitivity and specificity are simultaneously maximized. FF, furosemide/fludrocortisone test; idRTA, incomplete distal renal tubular acidosis. Pooled urine and blood analytes, separated by test and nadir urinary pH, are depicted in Figures 3 and 4, respectively. Consistent with previous reports (1,12), we observed that the nadir urinary pH was achieved at approximately 3 hours in the furosemide/fludrocortisone test and at approximately 5 hours in the ammonium chloride test (Figure 3, A and F). As shown in Figure 3, B–E, participants with a nadir urinary pH ≥5.3 in the ammonium chloride test displayed lower hourly urinary sodium, chloride, and ammonium excretions, whereas the urinary volume was unaltered. In the furosemide/fludrocortisone test, participants with a nadir urinary pH ≥5.3 also displayed reduced hourly urinary sodium and chloride excretions, but only in the second half of the furosemide/fludrocortisone test (Figure 3, H and I). In contrast, urinary ammonium excretions in the furosemide/fludrocortisone test were similar in both groups of patients (Figure 3J) and urinary volumes were higher in participants with a nadir urinary pH ≥5.3 (Figure 3G). Time course of urinary parameters separated in participants with nadir urinary pH <5.3 and ≥5.3. Gray bars indicate nadir urinary pH <5.3, black bars indicate nadir urinary pH ≥5.3. Values shown are medians and interquartile range. Between-group differences were determined by Mann–Whitney U test. *P< 0.05; **P< 0.01. (A) Time course of urinary pH in the ammonium chloride test; the dashed line indicates the diagnostic threshold pH 5.3. (B–E) Time course of urinary volume, sodium, chloride, and ammonium in the ammonium chloride test. (F) Time course of urinary pH in the furosemide/fludrocortisone test; the dashed line indicates the diagnostic threshold pH 5.3. (G–J) Time course of urinary volume, sodium, chloride, and ammonium in the furosemide/fludrocortisone test. Furosemide/fludrocortisone tests lasted 5 hours; ammonium chloride tests lasted 6 hours. FF, furosemide/fludrocortisone test. Time course of blood parameters separated in participants with nadir urinary pH <5.3 and ≥5.3. Blood was drawn at baseline and at 2 and 4 hours in ammonium chloride tests, and at baseline and at 3 and 5 hours in the furosemide/fludrocortisone tests. Gray bars indicate nadir urinary pH <5.3; black bars indicate nadir urinary pH ≥5.3. Values shown are medians and interquartile range. Between-group differences were determined by Mann–Whitney U test. *P< 0.05; **P< 0.01. (A and B) Time course of venous blood pH and venous bicarbonate in the ammonium chloride test. (C and D) Time course of venous blood pH and venous bicarbonate in the furosemide/fludrocortisone test. FF, furosemide/fludrocortisone test. As expected, the administration of ammonium chloride resulted in a large decrease of venous pH and bicarbonate compared with baseline (systemic acid load) (Figure 4, A and B), whereas the administration of furosemide and fludrocortisone caused a small increase of venous pH and bicarbonate compared with baseline (increase of urinary acid excretion) (Figure 4, C and D). During the ammonium chloride and furosemide/fludrocortisone tests, venous pH was not significantly different between participants with nadir urinary pH <5.3 and ≥5.3 at all time points measured. However, venous bicarbonate was significantly higher at baseline and at 4 hours during the ammonium chloride test in participants with nadir urinary pH ≥5.3 (Figure 4, A and B). 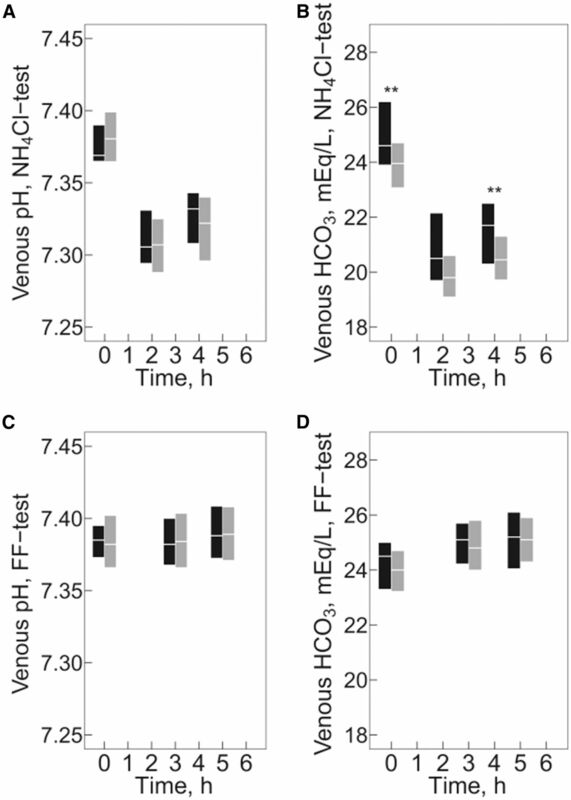 In contrast, venous pH and bicarbonate were not different between participants with nadir urinary pH <5.3 and ≥5.3 during the furosemide/fludrocortisone test at all time points tested (Figure 4, C and D). Is the Nadir pH 5.3 for the Diagnosis of Incomplete dRTA Justified? Our results indicate that urinary acidification capacity is a continuous trait in stone formers. In addition to alkaline urinary pH, hypocitraturia and hypercalciuria are important prolithogenic factors frequently encountered in patients with dRTA. As the next step, we analyzed the association of the nadir urinary pH in the ammonium chloride test with 24-hour calciuria or 24-hour citraturia. As shown in Figure 5, A and B, with increasing nadir urinary pH, citrate excretion decreased and calcium excretion increased. Using the established pH<5.3 for diagnosis, citraturia was significantly lower in participants with incomplete dRTA (Figure 5C). However, 24-hour calciuria was not different between participants with and without incomplete dRTA at this pH threshold (Figure 5D). We next performed these analyses at different arbitrarily defined urinary nadir pH thresholds ranging from pH 5.1 to 5.5. As shown in Supplemental Figure 3, a pH<5.3 was the only threshold pH which allowed a separation of the two groups of participants on the basis of citraturia. In contrast, at all pH thresholds tested, calciuria was not different between the two groups of participants. Association of nadir urinary pH with 24-hour citraturia and calciuria. (A and B) Associations of nadir urinary pH in the ammonium chloride test with 24-hour citraturia and with 24-hour calciuria, respectively. Black lines (A and B) indicate the cubic spline function of the association. Gray shaded areas represent the 95% confidence interval for the fitted splines. Vertical dashed lines indicate the diagnostic threshold pH 5.3. (C and D) Twenty-four-hour citraturia and 24-hour calciuria separated in participants with and without incomplete distal renal tubular acidosis. Box plots indicate 25th, 50th, and 75th quantiles of the distribution of the 24-hour excretion for each group. Whiskers above and below the box indicate the 1.5 × IQR: (25th – 1.5 × IQR) and (75th + 1.5 × IQR), respectively. Between-group differences were determined by Mann–Whitney U test. idRTA, incomplete distal renal tubular acidosis; IQR, interquarticle range. This is the first controlled study that rigorously compared the performance of the furosemide/fludrocortisone test and nonprovocative parameters with the gold standard ammonium chloride test for the diagnosis of incomplete dRTA in stone formers. One important feature of this study compared with previous studies is the fact that we recruited stone formers without preselection into the study, i.e., regardless of fasting or 24-hour urinary pH, stone type, or presence of hypocitraturia or hypercalciuria. The use of an unselected patient population renders our results applicable to general kidney stone practices. The results of our study suggest that incomplete dRTA can be reliably excluded by use of the nonprovocative parameters which include second morning fasting urinary pH and plasma potassium. If a provocative test is required, the furosemide/fludrocortisone test has excellent negative predictive values. If incomplete dRTA cannot be excluded by either approach, the diagnosis can be confirmed by ammonium chloride testing. Twenty-four-hour urinary pH and prevalence of calcium phosphate–containing stones were significantly higher in stone formers with nadir urinary pH ≥5.3 in the furosemide/fludrocortisone test. Similar results were obtained with the ammonium chloride test, but the difference did not quite reach statistical significance. In contrast, uric acid calculi, typically associated with low urinary pH, were not observed at all in stone formers with incomplete dRTA defined by either test (22). This finding corroborates with previous studies that reported an association of a urinary acidification deficit with calcium phosphate–containing stones (23–25). Interestingly, plasma potassium and 24-hour citraturia were lower in stone formers with incomplete dRTA. The lower plasma potassium may at least partially explain the reduction in citraturia via a reduction of proximal tubular pH which is well known in potassium deficiency (26). The pathogenesis and etiology of the reduced plasma potassium remains unclear; 24-hour urinary excretions of sodium and potassium were similar in both groups of patients. Our surprising observation that stone formers with incomplete dRTA had a higher venous bicarbonate stands in contradiction to a recent study that reported results of urinary acidification testing in 57 individuals with primary Sjögren’s syndrome (27). Patients with primary Sjögren’s syndrome and incomplete dRTA had lower venous pH and bicarbonate compared with patients with primary Sjögren’s syndrome without incomplete dRTA, but higher venous pH and bicarbonate compared with patients with primary Sjögren’s syndrome and complete dRTA. Although confirmation by longer-term studies in primary Sjögren’s syndrome patients is lacking, such a constellation would be compatible with incomplete dRTA being a “preacidotic” forme fruste of complete dRTA. In contrast, our finding of an increased venous bicarbonate in individuals with incomplete dRTA suggests that the underlying pathophysiology in stone formers may be different, as suggested previously (28). Importantly, our study reveals for the first time that urinary acidification capacity is not a dichotomous but a continuous trait in stone formers. This observation stands in contrast to the initial description by Wrong and Davies and the currently held opinion that incomplete dRTA represents a distinct entity with respect to urinary acidification capacity. On the basis of urinary citrate excretion, but not on the basis of urinary acidification capacity or calcium excretion, a threshold pH <5.3 can be justified for the diagnosis of incomplete dRTA. There are no randomized controlled trials in stone formers with incomplete dRTA. In small studies, treatment with alkali in adult stone formers with incomplete dRTA decreased calciuria, increased citraturia, and reduced stone formation rate (29–31). In stone formers with incomplete dRTA associated with medullary sponge kidney, alkali therapy also led to a decrease in stone passage and improvement of the associated bone disease (32–34). Results of these uncontrolled studies indicate that stone formers with incomplete dRTA constitute a unique subset of patients that may benefit from alkali treatment. However, alkali treatment was also effective in the prevention of recurrence in unselected cohorts of patients with calcareous nephrolithiasis (35). Thus, clearly, longitudinal and interventional trials are needed to further explore the prognostic and therapeutic relevance of diagnosing incomplete dRTA in stone formers. D.G.F. has served as a consultant for Otsuka Pharmaceuticals. D.G.F. has received unrestricted research funding from Novartis, Abbvie, and Otsuka Pharmaceuticals. O.W.M. served on the Advisory Boards for AbbVie, Allena, Ardelyx, Genzyme-Sanofi, and Triceda. D.G.F. was supported by the Swiss National Centre of Competence in Research TransCure, the Swiss National Science Foundation (grants # 31003A_135503, 31003A_152829, and 33IC30_166785/1), and by a Medical Research Position Award of the Foundation Prof. Dr. Max Cloëtta. G.P. was supported by the Marie Curie Actions International Fellowship Program. O.W.M. was supported by the National Institutes of Health (P30 DK-079328, R01 DK081423, and T32DK007257), the American Heart Foundation, and the Charles and Jane Pak Foundation. See related editorial, “Refining Diagnostic Approaches in Nephrolithiasis: Incomplete Distal Renal Tubular Acidosis,” on pages 1380–1382. This article contains supplemental material online at http://cjasn.asnjournals.org/lookup/suppl/doi:10.2215/CJN.01320217/-/DCSupplemental.